ATLANTA (AP) — Nick Saban and Kirby Smart posed stiffly behind the trophy, forcing smiles for the cameras. 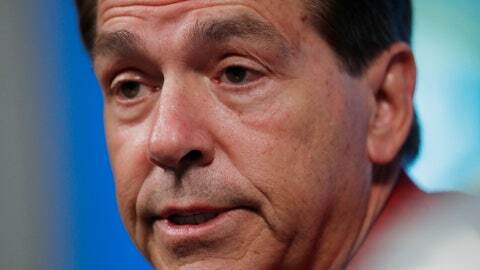 Saban whispered something in his former assistant’s ear, drawing a bit of a chuckle. But, really, they could’ve done it months ago. If this game goes down to the wire, Alabama star quarterback Tua Tagovailoa could see significant action in the fourth quarter for the first time all season. He has attempted — and completed — just three passes for 56 yards in the final 15 minutes. By contrast, Tagovailoa completed seven passes for 54 yards against the Bulldogs in the fourth quarter of last season’s national title game. Georgia hasn’t faced many late challenges, either. The Bulldogs have gone to the fourth quarter with double-digit leads in 10 of their 11 wins — the only exception being a victory over Florida , which they led 23-14 with one period left. Alabama hasn’t lost to an SEC East opponent in more than eight years. The Tide has a 23-game winning streak over teams from the opposite division since a 35-21 loss to South Carolina on Oct. 9, 2010 . They are 4-0 in SEC championship games during that streak, including a 32-28 victory over Georgia in 2012. Tagovailoa has put up Heisman-worthy numbers in his first season as the starter , completing more than 70 percent of his passes for 3,189 yards and 36 touchdowns with just two interceptions. Georgia counters with one of the nation’s best defensive backs, lockdown corner Deandre Baker. The Thorpe Award finalist has only two interceptions, none since Week 3, but that’s because teams rarely throw his way. It will be interesting to see if Tagovailoa goes right at Baker or sticks with the plan used by most Georgia opponents — look to the other side of the field, where the Bulldogs start redshirt freshman Eric Stokes but usually provide plenty of help for the young cornerback. Saban is 15-0 against his former assistants, including wins this season over Jimbo Fisher (Texas A&M), Billy Napier (Louisiana-Lafayette) and Jeremy Pruitt (Tennessee). The only one who’s come close in those 15 games? Smart, in that title game.